Praise be to Allah (SWT) for the blessings of faith, and may His peace and blessing be upon the seal of the Prophets, Mu­hammad Bin Abdullah, his family and companions until the end of time. The believer should be cognizant of the fact that the month of Ramadan is nearing are end and its departure is imminent. Ramadan may be a witness for or against you. Who­ever is blessed to fill it with faith and good deeds should thank Allah for the honor, and must be assured of reward in the Hereafter. For Allah (SWT) will never deny a soul his or her just and complete reward. Whoever fills it with unseemly acts should return to Allah in repentance, which He has promised to accept. Allah (SWT) has mandated acts of worship at the end of Ramadan in order to assist us in our desire to express our love for Allah, to strengthen our faith and increase the weight of our deeds. He mandated fast breaking alms (Zakatul Fitr); legis­lated glorification and exaltation of Allah, (Takbeer) on the eve of 'Eid beginning from sunset until the time of 'Eid. market places, and in homes affirming Allah's glory and publicizing His mercy upon them. Women will express their Takbeer silently as they are commanded to conceal their voices. Allah (SWT) legislated `Eid prayer. It culminates in the remembrance of Al­lah (SWT). He commanded women to leave their homes and attend 'Eid, whereas their praying at home is at other times more preferable and better. It is recommended to go to the `Eid site walking instead of rid­ing unless the place is far or the person is unable to walk due to age or illness. Men should wear their best clothes, but should avoid silk and gold. Women should wear modest and decent long dresses, and avoid flashy or immodest outfits and per­fumes in their outing for `Eid. 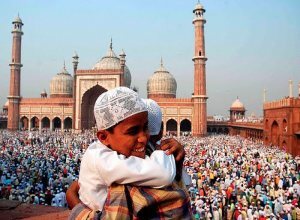 `Eid prayer should be observed in the most humble and devoted manner. One should praise Allah often and seek His mercy and should remember the ultimate gathering in the Hereafter (Al Maqamul a'Azam). He should be cognizant of the fact that there is ine­quality and disparity among the ranks of the believers on `Eid day as there will be disparity in ranks among the believers in the Hereafter. One should be jubilant that he or she is blessed to fast during Ramadan and has been able to observe prayers, recitation of Al-Qur`an and giving of Zakaat. These acts are better for us than this world. Indeed, if the `Ebadah of this Ramadan is finished and the `Eid prayer is completed the `Ebadah of the believer will not finish until death. Also, “And serve thy Lord until there comes unto thee the Hour that is certain.” (Al-Qur'an, 15: 99). So the service to Allah is continuous until the end of life. The end of Ramadan does not mean the end of fasting. There is the highly recommended fasting of six days in Shawwal, and three days sunnah fasting in every month, as well as on Mondays and Thursdays, and fasting most of Shaban and Muharram. If Ramadan is over, night prayers are not. Praise be to Allah, this remains a sunnah of the Messenger (saas) every night of the year forever. The Sunnah prayers (Rawatib) before or after the five daily prayers are 12 raka'aat: four before Zuhr (Noon prayer), and two after; two raka'aat after Maghrib (Evening prayer); two raka'aat after `Ishah (Night prayer), and two raka'aat before Fajr (Morning prayer). Dear believer, strive in the path of Allah and obey His Messen­ger's commands. Avoid disregarding His commands so that you will deserve a good life in this life and the life after. O Allah, keep us firm in our faith and good deeds and bless us with a good life, and make us join the ranks of the righteous people; and praise be to Allah (SWT), the Lord of the worlds, and may His blessings and peace be upon Muhammad, his family and companions. Amin. This humble work was completed on Thursday, 18th of Rabi'ul Awwal 1412 AH, (September 26, 1991 AD) by His humble servant, Tajuddin Bin Shu'aib. Praise be to Allah in the begin­ning and in the end. 1. To rise early in the morning. 2. Take a full bath. 4. Wear the best cloths that he had. 6. To eat something sweet like dates before leaving home. 7. Go to the Eid prayer location very early. 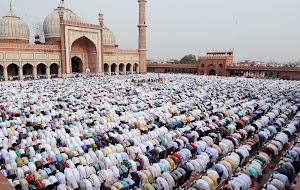 (The Prophet use to offer Eid prayer in the central location, that is not to offer it in a mosque of a locality without any legitimate excuse). 8. The Prophet used to go to the Eid Prayer location by one route and will return through another route. 9. He used to go for Eid on foot. 11. The Prophet used to give Sadqa-e-Fitr (zakatul fitr) for before the Eid day. But if you have not done so please give now before the Eid. 7. After the Khutbahs, a talk will be given to highlight important issues facing the Muslims and pertinent aspects of the particular Eid. 8. At the end of the talk Salat-o-Salaam will be sent upon the Beloved Prophet Salla Allahu Alayhi wa Sallam. To recite the Salat-o-Salaam collectively while standing is a means of obtaining Mercy and Blessings of Allah Almighty. 9. Then the Imam will make the final du’a for the general well being of the Muslim Ummah. 10. It is Mustahab to hug and shake hands with fellow Muslim bretheren.